This June our Akira Kurosawa film club becomes a drama club as we read Anton Chekhov’s play A Marriage Proposal, which Kurosawa directed for stage following the release of Drunken Angel in 1948. 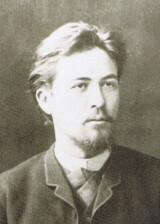 Chekhov’s A Marriage Proposal (Предложение, sometimes also translated as simply Proposal) is a fairly short single-act farce written in the late 1880s and first staged in 1890, which is also roughly when the picture of him that I have here was taken. Wikipedia has more information about the play. The text is available in English for free as part of Project Gutenberg’s Plays by Anton Chekhov collection, as well as at One Act Plays. Note that in case you have an ebook reader, Gutenberg offers the text in formats including ePub and Kindle, in addition to html and plain text. For those of you who signed up for this film club to watch things, not read them, there is at least one production available on YouTube: an Edge Ensemble Studio Showcase in two parts (part 1 and part 2). Or, if you would rather listen to the play, you can download a reading from Librivox. Since the play is so short, an additional theme for this month is Kurosawa’s Russian influences. So, if you have a Dostoevsky novel sitting on your desk that you have been wanting to read, there is not better time than the present! Let us know if you decide to explore Kurosawa’s relationship with Russian authors or film makers and what you find. In July we continue with The Quiet Duel. For a full Akira Kurosawa film club schedule, see AK Online Film Club. If this is what the proposal is like, I dread to think of what the marriage would be like. Do we know anything about who starred in Kurosawa’s production of this? This is, of course, pure speculation. What do you think interested Kurosawa in the play enough to stage it? One thing that I noticed was how non-cinematic it is. I don’t think that it could work as a film. Maybe Kurosawa chose this piece to take himself out of his own comfort zone? I was also thinking about the mannerisms of the characters, that particular late 19th century Russian upper class behaviour. Isn’t that in some ways quite similar to Japanese customs? Vili – I wondered if it was a double bill or if he used the same actors for both productions. I’d have to go back and read the play again to give a definitive answer to why Kurosawa chose it or to evaluate its non-cinematic nature. It is very talky. Perhaps he chose it because of the amount of conflict and the swings in the characters’ moods. All that seems fairly typical of Russian literature of the era; I remember encountering, and being somewhat bewildered by, the same things in Dostoevsky’s writings. The characters in Gorky’s The Lower Depths seem positively even-tempered by comparison. Perhaps their poverty smoothed the sharp edges of their personalities. I don’t know; other than the initial politesse, 19th century Russian upper class behavior seems fairly different from Japanese customs. I don’t think the Japanese would be quite so blunt to someone’s face. Perhaps if they were speaking to an intermediary they would be. The mood swings do indeed feel very Kurosawa-like — I can actually almost see Takashi Shimura, a little hunched but devilishly determined, marching up and down the stage as Stepan! I of course have no idea whether that ever happened.